The Department of Archaeology and Historic Preservation (DAHP) is the primary contact for three historic registers (the National Register of Historic Places, the Washington Heritage Register and the Heritage Barn Register) that track Washington's historic and cultural resources. 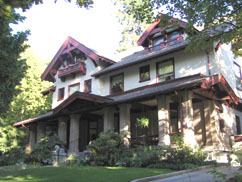 The National Register of Historic Places is the official federal listing of significant historic, architectural, and archaeological resources. The Washington Heritage Register identifies and documents significant historic and prehistoric resources throughout Washington at the state level. The new Heritage Barn Register was established in May of 2007 and was designed to specifically recognize agricultural resources in the state. To date over 10,300 properties represented by over 2,400 listings have been added to the three registers. Although DAHP strongly encourages the preservation of National and State Register properties, listing offers no protection against alteration or demolition. Private owners of National and State Register properties using private funds may alter or demolish these properties within existing local building regulations. Projects involving federal or state agency actions are reviewed by DAHP with the goal of preserving historic resources whenever possible. Each register is reviewed for listing by the Washington State Advisory Council on Historic Preservation (ACHP), which is comprised of citizens knowledgeable in Washington's history, archaeology, and architecture. The nine member board reviews nominations to the registers three times a year, at various locations across the state. DAHP staff is available to assist with the initial assessments of eligibility of properties to the registers and to provide guidance in the completion of register nominations. Many sites, once listed on the National Register, are denoted by bronze plaques. These plaques have a consistent look and feel nationwide. While DAHP does not fund the installation of plaques, we do provide information on where to obtain a plaque. 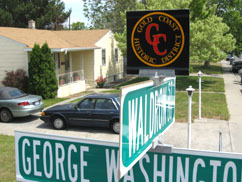 Many communities also have markers along the highway which denote the site of a Washington Heritage Register property or a National Register site. These are the infamous "brown signs" along state highways. DAHP does not regulate these signs. Requests to have a "brown" historic attraction sign installed in your community should be through the Regional office of State Department of Transportation (DOT).